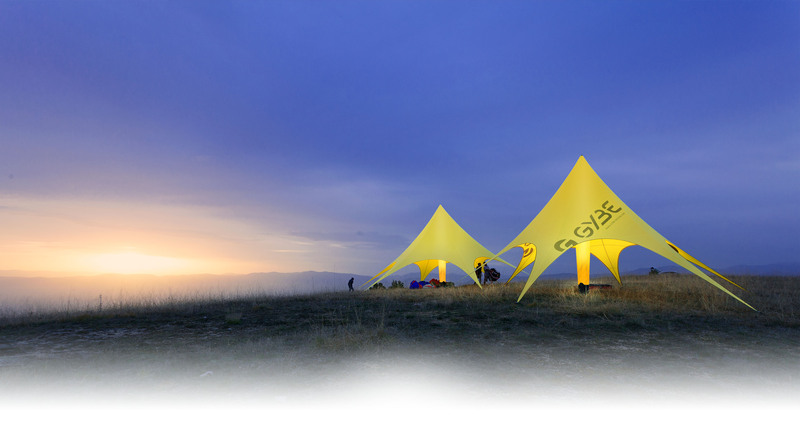 GYBE® complemented the Star Tent with a unique luminous source that creates for the first time a lounge-atmosphere which can be used versatile for your promotion or festivals. The Star Lounge® combines functionality with extraordinary ambience: By using the integrated LED-BAND, the inflatable support structure can be illuminated into 16.7 million different colour moods and light intensities (RGB-spectrum/range). 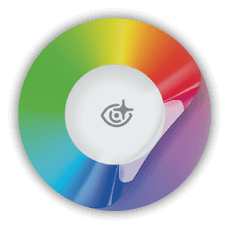 You can control all the functions like colour shade, intensity and lighting effects easily by using the touch-remote-control. The GYBE® Star Lounge® is not only impressive because of its remarkable design. Thanks to a modern printing process the GYBE® Star Lounge® can be printed as of now photorealistic. By means of a new refining method your tent becomes a canvas of brilliant photos with impressive sharpness, high color intensity and captivating resolution. 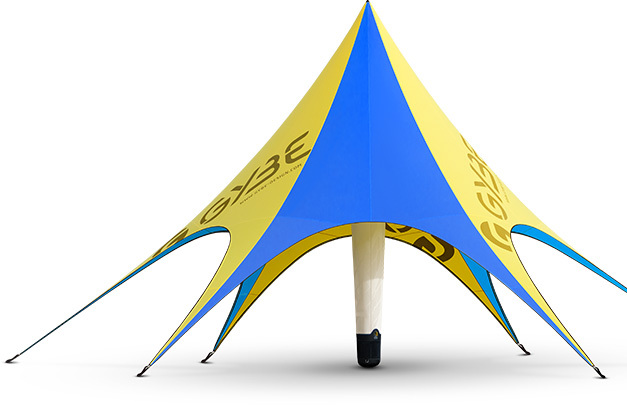 The GYBE® Star Lounge therefore attracts everyone’s attention and turns into a unique advertising space. 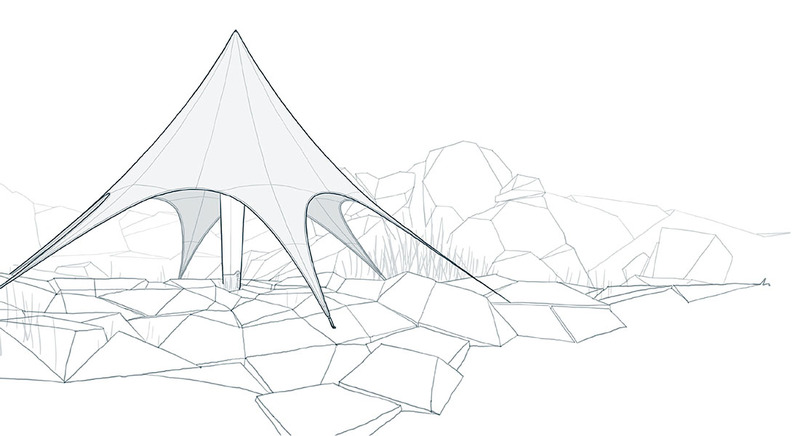 Furthermore, the new printing process makes it possible to individually color the outer panels of the Roof and Sides. Sublimation printing is a process in which the color pigments are brought deeply into the printable material. A sublimation foil is digitally printed in photo quality and then with pressure and heat transferred to the material. The printing result is extremely brilliant because the warmth gives the pigments a winning brightness and they durably adhere to the fabric. Sublimation printing is extremely suitable for large or fullprint designs. You can print over the complete length and breadth of the material, which enables the colorizing of the Roofs or Sides in your Corporate Identity colors. Firstly, the special foil is printed with the wished design on the reverse. 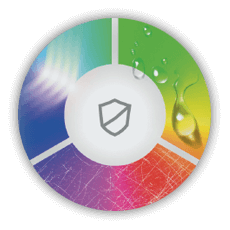 The applied ink contains many chromophoric pigments and is highly concentrated. Subsequently, the material to be printed and the special foil are pulled together through a heating press. Here the colorant from the carrier foil is transferred to the material under high pressure and temperature. As opposed to sublimation printing, transfer printing is especially suitable for small to mediumsized designs, which are to be shown advantageously on colored material. Latex ink is digitally printed in photo-quality on the carrier foil. This foil is then cut to size according to the design and then transferred under pressure and heat on the surface of the material. Since the carrier foil is white, colored materials can also be printed. The printing result is absolutely brilliant, also on black materials. Firstly, the special foil (transfer) is printed with the required design. Subsequently, the transfer foil is cut to size with the help of the design. The cut-out material to be printed on is spread out crease-free on the transfer press and the transfer foil positioned on the material. Under heat and high pressure the transfer foil is transferred to the material. Like all of our products the Star Lounge® can be customized individually. The customization of the colours for the canopy and side parts can be freely selected from the color palette and adjusted to your special needs. The inflatable can also be adapted in colour upon request. The color selection is only recommended with unlit inflatables. A unique effect can be achieved by a transfer print on the inflatable support structure.The printing and the luminosity of the support structure including your logo or an distinctive pattern will create a unique lighting effect. Additionally, it is possible to print on the roof and the sidepanels as partial or fullprint to use them as advertising space. Our printing process furthermore allows for individual colouring of the outer side of the roof and sidepanels. The Star Lounge® is made of hardly inflammable materials, additionally all side parts are water-repellent and resistant to UV-rays. The inflatable supporting structure consists of a high-strength Dacron-shell. We use an elastic PU-foil for the hermetical interior hose. This construction has been tested under heaviest conditions in the Kite-sports thousands of times. The integrated 12V light band with 120 RGB-diodes per meter spreads over the whole height of the support structure. 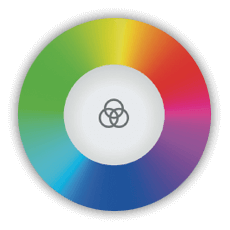 Through the interaction of the red, blue and green LEDs in the column it is possible to reproduce every colour of the RGB-spectrum. 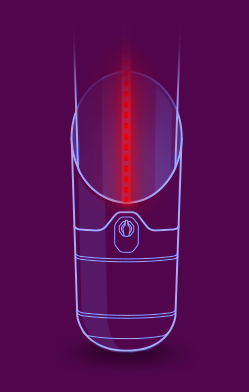 The light band’s intensity is very high due to the high number of diodes. 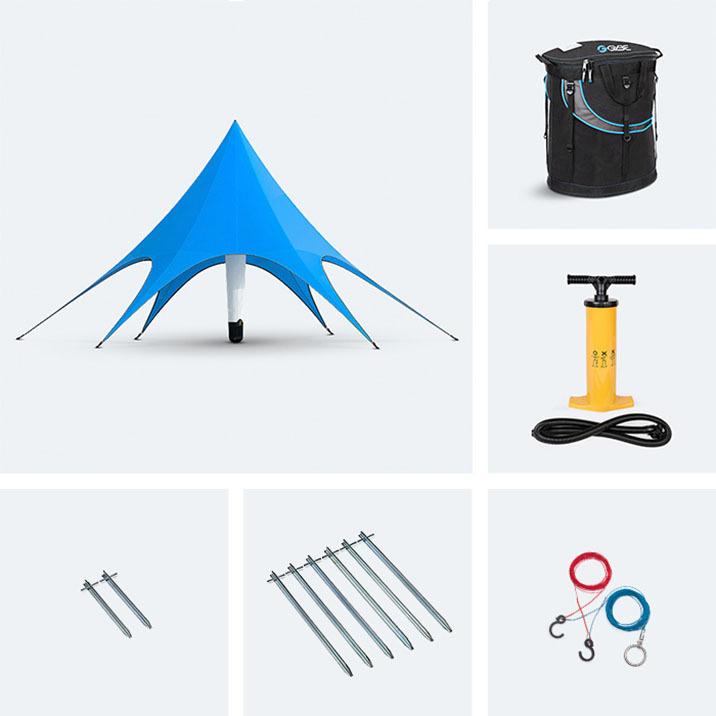 In a standard-delivery you will find the tent with canopy, the inflatable support structure, various pegs, a transportation bag, a double-stroke hand pump, as well as a construction aid.Furthermore, it is possible to order additional articles, like the LED-band. Although the high level of customisability GYBE® provides very short delivery times for all its products. We are pleased to submit you a custom-made offer. Our products apply to the highest production- and quality standards. If your tent has been damaged it can be repaired at our german service departement, quick and efficent. An overhaul will always be done with original material and applies to the strict GYBE® production standards.